Outstanding efficiency and maximum flexibility – the new injection moulding system solutions supplied to BMW’s Leipzig factory by ENGEL AUSTRIA meet both of these requirements. They will be used to manufacture lightweight components for car body shells. The current delivery consists of ENGEL duo injection moulding machines with clamping forces of 4000 and 2700 tonnes. They have been set up to perform at the highest possible level and are also equipped with ENGEL’s energy-saving system, ecodrive, because sustainability is another main aspect of this project. One special feature of the injection moulding processing cells in Leipzig is that they are each made up of two large-scale ENGEL duo machines which have been installed back-to-back to create double systems. In master/slave mode, both machines can be controlled together so that two components are injection moulded and completed simultaneously. The bodywork components will however only comply with the high quality requirements if they both undergo exactly the same aging process after the injection moulding stage. Machines which have been linked together can also be separated from each other and fitted with different moulds. This increases the availability of the systems and enables them to guarantee a high degree of production flexibility. 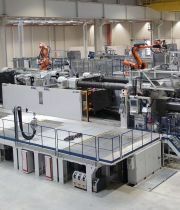 All the injection moulding machines are equipped with industrial multi-axis robots, and as the general contractor for the manufacturing cells, ENGEL took responsibility for ensuring that automation was incorporated in the solution it provided BMW with. This also included a menu-driven mould changing feature, a system display screen, and data tracing. The huge range of parts which the manufacturing cells will be making in the future was taken into consideration from the very beginning. Comfortable and easy to operate, the new machines’ control system also meets the demand for outstanding efficiency and maximum flexibility.